The dry tuber of perennial herbaceous plant Arisaema erubescens (Wall.) Schott, A. heterophyllum Bl. or A. amurense Maxim. of family Araceae. Henan, Sichuan provinces and northeast China. Collected in autumn and winter when stem and leaf withered. Lightly pungent smell and spicy taste. Processed with ginger juice and alum. Bitter, pungent, warm, toxic; lung, liver and spleen meridians entered. Dry dampness and resolve phlegm, extinguish wind and stop spasms, resolve swelling and dissipate nodulation externally. Its action of drying dampness and resolving phlegm is slightly weaker than that of Ban Xia while warmer, dryer and more toxic than that of Ban Xia. So it is not used as common as Ban Xia when treating damp-phlegm and cold-phlegm. For damp-phlegm obstruction of lung, cough and profuse expectoration and distension and oppression of chest and diaphragm, it is usually combined with dampness-drying and phlegm-resolving herbs. For instance it is combined with Ban Xia, Zhi Shi and Ju Hong n Dao Tan Tang from Chuan Xin Shi Yong Fang (Practical Prescription of Message Delivery). For cough due to phlegm-heat, it is combined with lung-clearing and phlegm-resolving herbs. For instance it is combined with Huang Qin and Ban Xia in Xiao Huang Wan from Bao Ming Ji written by Zhang Jiegu. This herb is good at dispelling wind-phlegm from meridians and collaterals to stop spasms, so it is usually indicated for all the syndromes of wind-phlegm. For hemeplega, stubborn numbness of hands and legs, and deviated mouth and eyes resulted from wind-phlegm accumulation of meridians and collaterals, it is usually combined with damp-drying and phlegm-resolving herbs. For instance it is combined with Ban Xia, Bai Fu Zi and Chuan Wu in Qing Zhou Bai Wan Zi from Tai Ping Hui Min He ji Ju Fang. For wind-phlegm vertigo, it is usually combined with dampness-drying and phlegm-resolving herbs and liver-pacifying and wind-extinguishing herbs such as Ban Xia, Tian Ma and Gou Teng. For epilepsy caused by upward obstruction of phlegm and turbidity in clear orifice, it is combined with phlegm-resolving resuscitatives and wind-extinguishing and spasms-stopping herbs. For instance it is combined with Ban Xia, Quan Xie, Jiang Can and She Xiang in Wu Xian Wan from Yang Shi Jia Chang Fang (Yang's Family Recorded Prescriptions). This herb can attack toxin, dissipate nodulation and resolve swelling externally. It is ground with vinegar singly for external application. For exuberant heat-toxin accumulation, it is better combined with other heat-clearing and toxicity-relieving herbs, and abscess and swelling-dispelling herbs. For instance it is combined with Da Huang, Tian Hua Fen and Huang Bai in Ru Yi Jin Huang San from Wai Ke Zheng Zong. 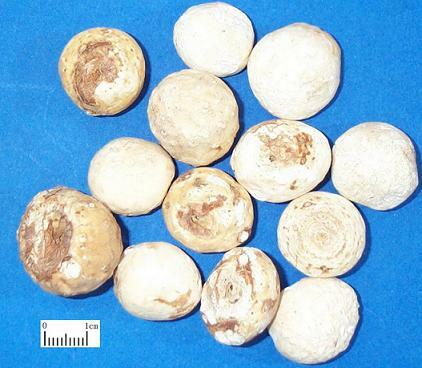 For phlegm nodule and scrofula, it is ground and mixed with vinegar for external application, or combined with other phlegm-resolving and nodulation dissipating herbs. For poisonous snake bite, it is combined with Xiong Huang applied externally. Decoct 3~10 g. Mostly processed. Proper dose for external application. Prohibited for yin deficiency with dry phlegm and the pregnant women.